Thick, rich and decadent European-Style Hot Chocolate is the ultimate wintertime indulgence after a day spent on the slopes or out in the snow! This recipe can be made in the slow cooker or on the stove top and is sure to warm you from the inside out! marshmallows, whipped cream, crushed candy canes, chocolate syrup, salted caramel, sprinkles, orange slices, cinnamon, etc. Combine the water, cocoa powder, sugar and marshmallows in a medium saucepan over medium heat. Cook and stir until marshmallows are dissolved. In a slow cooker, combine the milk, cream, chopped semisweet chocolate and vanilla. Stir in the cocoa powder mixture. Heat on low for 4-6 hours, stirring well once an hour so that the chocolate that settles on the bottom does not burn. 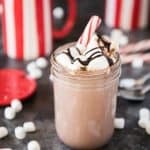 If you don't have a slow cooker or want your hot chocolate to be ready faster, you can cook this in a large dutch oven or pot over medium-low heat, until the chocolate is melted, stirring occasionally to make sure the chocolate doesn't burn.